PowerAce analyses the impact of different market designs (energy-only-market, strategic reserve, capacity markets) and policy measures on investments in low-carbon technologies (with focus on flexibility options) and their contribution to the security of supply on national and European level. The results will be compared with the ELTRAMOD-results to identify need for adjustments in existing market designs and regulatory frameworks. PowerACE is an agent-based, bottom-up simulation model for wholesale electricity markets. The main generation companies in the modelled system are represented by individual agents. The model integrates the short-term dispatching of generation units with an hourly time resolution and long-term capacity planning with regard to conventional power plants. 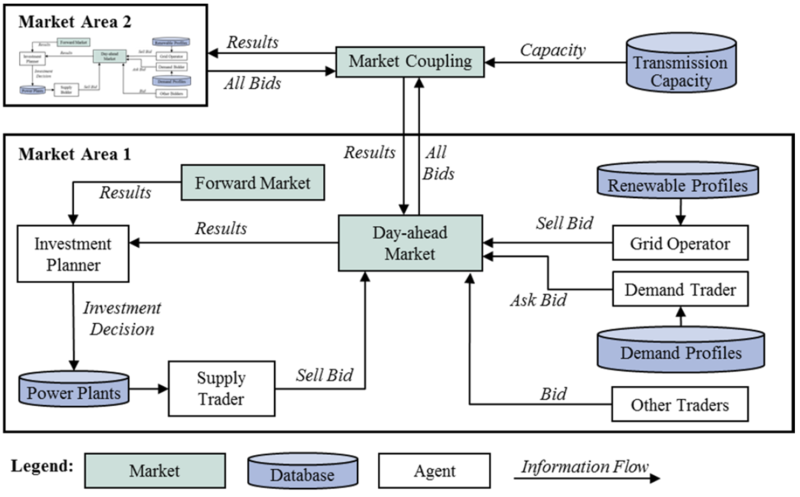 The model can be applied to single market areas as well as to an interconnected system using a NTC-based market coupling approach. Amongst others, the simulation model can be used to analyze in detail the formation of clearing prices on spot markets, issues of market power and market design options. PowerACE is an agent-based, bottom-up simulation model for wholesale electricity markets. With respect to the agents, major generation companies are represented by individual agents. Thereby, conventional power plants are considered in detail. Other agents are modeled, amongst others, to bid electricity demand, generation from renewable energy sources, exchange, and to operate markets. Concerning the short-term markets, the focus is on the day-ahead market. Additionally, the model can simulate an intraday market and the auctioning of reserve capacities. The bidding behavior of generation agents is generally based on variable generation costs, start-up costs, and potential strategic considerations (e.g. scarcity mark-up). Regarding the geographical scope, different market areas can be coupled with a day-ahead market coupling algorithm based on NTC values. The short-term clearing of the markets is performed on an hourly basis. Furthermore, the model contains an investment planning module executed by each generation agent on an annual basis. For that purpose, different investment options are compared according to certain criteria, e.g. the net present value. Potential revenues for power plants can be generated from selling electricity in energy markets as well as from different capacity remuneration schemes (e.g. central capacity market, strategic reserve) depending on the respective configuration. The model has been mainly applied to simulate the German wholesale electricity market. Additionally, data for the Central Western European region is currently in preparation. Amongst others, the model can be used to explore the formation of historical electricity prices or to test different market design options for electricity markets. Furthermore, single decentralized electricity systems can be integrated for a detailed analysis of load flows in distribution grids and potential interactions with centralized markets. The model in general is implemented in Java. The agent-based simulation model, PowerACE, will be used in REFLEX to analyse the impact of different market designs (energy-only-market, strategic reserve, capacity markets) and policy measures on investments in flexibility options and their contribution to the security of supply on national and European level. Therefore, different model instances have to be developed to address the questions, which flexible options will be exploited by which market players (ownership structure) and in which scale / size considering different design options for the electricity market at EU-country level, but also a unique market design applied in all countries of the market coupling area within the EU. PowerACE interacts with the other models in the REFLEX project, receiving different input values from them, such as potential curves for different flexibility options, deployment rates depending on related costs etc. and provides the other models with important data on the capacity development of conventional power plants and flexibility options, such as different energy storages, for different market design options that can be installed by the regulators. it can apply different design options for the electricity market for single countries, but also for the overall coupled market area. it applies the market actor perspective into the decisions done in the model. 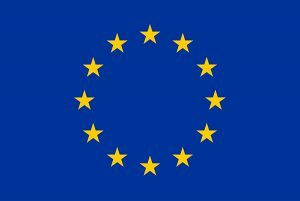 The main market players in the EU are modelled as single agents. it considers the role of flexibility options from the perspective of investors/market actors. Bublitz, A., Genoese M., Fichtner, W. (2014), An agent-based model of the German electricity market with short-time uncertainty factors, 11th International Conference on the European Energy Market (EEM). Ringler, P.; Bublitz, A.; Genoese, M.; Fichtner, W. (2014): Eine modellgestützte Analyse der Entwicklung eines gekoppelten deutschen und französischen Elektrizitätsmarktes, 13. Symposium Energieinnovation, Graz.